The clean, grassy flavor of asparagus shines through in this easy pasta dish. 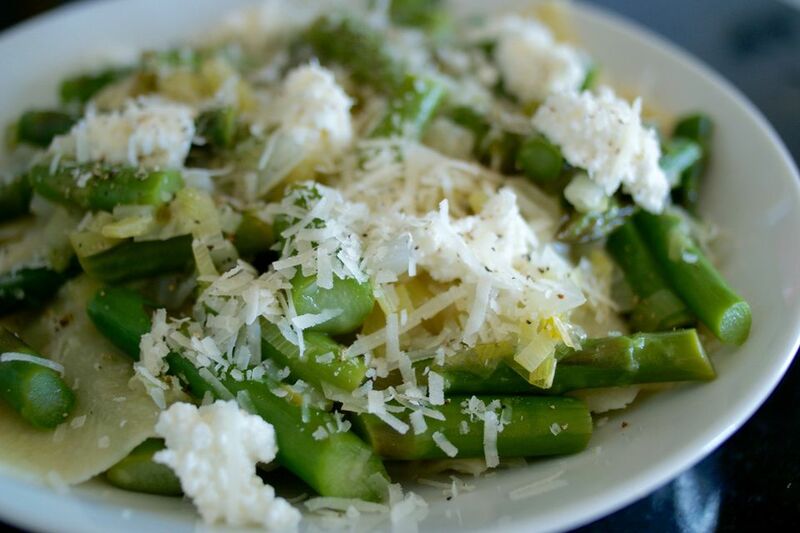 Creamy ricotta cheese adds a sense of indulgence without overpowering the asparagus. The sunny lemon keeps things bright even as the pasta gives it that cozy feeling. In short, it's a dinner perfect for those nights when it's cool enough to want something warm but spring enough to want something fresh. Using fresh pasta lets this dish shine. Long, tangled tagliatelle noodles are a good choice, as are fresh lasagna noodles cut into floppy squares. If all you have is dried pasta, though, it's still tasty. Fettucine or fusilli are both good choices. Put on a large pot of salted water to boil. Trim the asparagus: snap off the tough ends of each spear by holding it at either end and bending until it naturally snaps apart. Or, if you have a bit of time, you can keep more of the asparagus: cut off and discard the bottom 1/2-inch of each spear and then peel the bottom half of each spear. Cut the trimmed spears into bite-size pieces. Set aside. Peel and mince the shallot. Set aside. Working over a small bowl, zest the lemon: use a zester or microplane to remove only the thin yellow layer of the peel, avoiding the bitter white pith that lies beneath, until you have 1/4 teaspoon of zest. Cut the lemon in half and squeeze 2 teaspoons of lemon juice into the bowl with the zest. Reserve the remaining lemon for a final sprinkle of zest or spritz of juice at the end. Set aside. Choose a large sauté pan or other wide pan that will be big enough to hold the pasta and the asparagus. Set the pan over medium-high heat and melt the butter. Add the shallot and salt and cook, stirring frequently, until softened, about 3 minutes. Add the asparagus and cook, still stirring frequently, until the asparagus turns bright green, about 3 minutes. Add the 1/4 teaspoon lemon zest and 2 teaspoons lemon juice. Stir to combine. Taste and add more salt, lemon juice, and/or lemon zest as you like. Remove the mixture from the heat. Cook the pasta until tender to the bite, drain, and add it to the asparagus mixture. Gently toss to coat the pasta with the asparagus. Divide the pasta between 4 plates or bowls. Top the servings evenly with dollops of the ricotta, sprinkle with the Parmesan, and add freshly ground black pepper to taste. If you like lemon, a final tiny sprinkle of lemon zest or spritz of lemon juice can be lovely. Serve immediately.